Was there ever such a year as this for roses? Mine began in May. The ground was moist from plentiful April rain and, throughout the ‘merry month’ they relished a succession of warm, sunny days and – a rare treat here on the Welsh border – a string of frost-free nights. Roses stole my heart in June in the Netherlands, especially in the garden of veteran designer Albert Tielens, where they intermingled with clematis and climbed athletically into trees, dipping swags of flowery limbs into stretches of cool, reflecting water. A week later, I admired roses in the Azores, that Portuguese archipelago of nine volcanic islands halfway to Bermuda where, in some respects, the clocks stopped fifty years ago. While it can be too damp for some varieties in the mid-Atlantic, the climate is nevertheless perfect for hydrangeas, good companions for those roses that do flourish there. One of England’s greatest collections of roses resides at Mottisfont Abbey in Hampshire. They were the prized personal collection of rosarian Graham Stuart Thomas (1909–2003), legendary gardens advisor to the National Trust, and remain one of that institution’s most valued horticultural possessions. But I hear the cry, ‘Roses flower for such a short time, leaving behind a mess of twiggy branches of no ornamental worth.’ Not necessarily so. 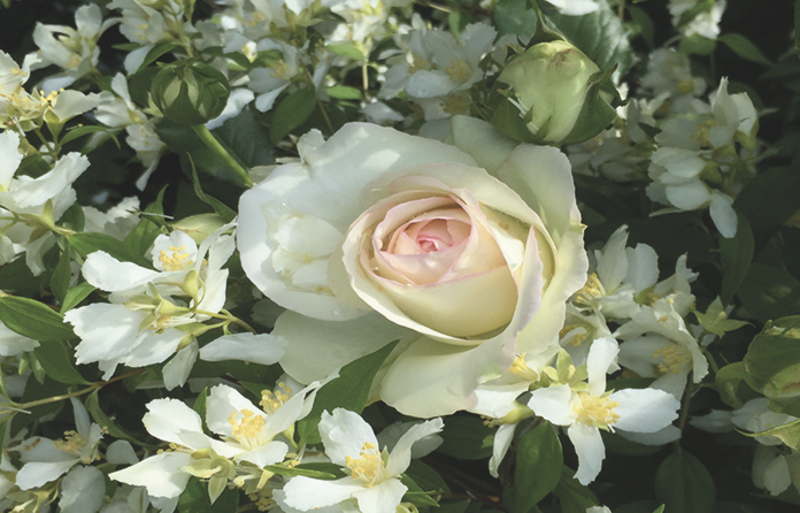 Take any rose catalogue and look for ‘repeat’ or ‘perpetual’ varieties. They are numerous and exist in splendour far beyond the stiff, less interesting and all-too-familiar Hybrid Teas. Old favourites include such Hybrid Perpetuals as highly scented, slightly cupped, clear, rose-pink ‘Baroness Rothschild’ (a repeater), ‘Fisher Holmes’ (a continuous flowerer edging towards scarlet and crimson), and ‘Mrs John Lang’, another repeater with ‘scented, shapely, silver-pink flowers’ beloved of Victorian and Edwardian gardeners. The late Peter Beales described this classification of roses as having emerged in the 1830s, ‘born from a varied and complex union, in which the Chinas, Portlands, Bourbons, Noisettes and, later, the Teas all played their part’. Of today’s breeders, David Austin can be ranked in the premier league. His so-called English Roses have admirers around the temperate world, and many of his introductions flower continually throughout summer, are disease-resistant, fragrant and delightfully old-fashioned in appearance. No one should be without his ‘Gertrude Jekyll’, his finest, perhaps – upright, robust, free-flowering, deep pink, with ‘a very strong, rich Old Rose fragrance of a high quality’. Jekyll (rhymes with treacle) wrote a string of important books from her Surrey home, Munstead Wood, and not surprisingly Austin has given that name to another, more recent, good doer, bearing dark crimson/purple flowers. A group consisting of just these two varieties will give great pleasure right through to the first frosts of autumn. If your preference is for yellow – a strong yellow – then Austin’s award-winning ‘Graham Thomas’ (yes, commemorating the aforementioned rose aficionado) is without rival. It’s somewhat upright, therefore good in formal plantings, with a fresh Tea Rose fragrance overlaid with a hint of violets. From the same stable comes ‘The Pilgrim’, of a softer, paler yellow classified as a climbing English musk rose. I no longer have beds and borders dedicated solely to roses, preferring instead to set them among other flowering shrubs. I’m pleased if they flop into the arms of neighbouring plants and thrilled when they infiltrate the lower branches of nearby trees. Can one sensibly ever have too many of them?